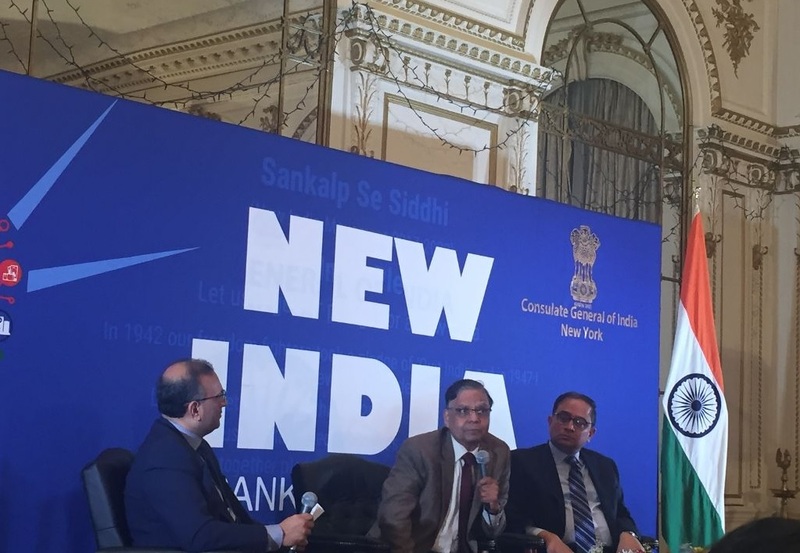 (File photo) Prominent economist Arvind Panagriya (center) delivering the inaugural New India Lecture Series in New York on January 22. Moderator Sanjay Bhatnagar (left) and Consul General of Indian in New York Sandeep Chakravorty are also seen. Columbia Business School professor Suresh Sundaresan will moderate the event. State Bank of India Chairman Rajnish Kumar will deliver the ninth “New India Lecture” at the Consulate General of India in New York on October 25. The lecture, billed “Banking in India: The way ahead,” will be moderated by Suresh Sundaresan, the Chase Manhattan Bank Foundation Professor of Financial Institutions at Columbia Business School, the consulate announced via twitter. Kumar took over as the 25th Chairman of the State Bank of India last October. Since joining SBI in 1980, he has served in various capacities, including as Managing Director of its National Banking Group and as Managing Director and CEO of SBI Capital Markets Limited, the merchant banking arm of the bank. The public sector SBI is the largest bank in India, with nearly a quarter of the market share in assets, as well as in loans and deposits. Sundaresan is also the Faculty Director of the India Business Initiative at Columbia Business School’s Jerome A. Chazen Institute for Global Business. The New India Lecture series was launched by the consulate and the US-India Strategic Partnership Forum in January. The mission of the series is to shed light on ways of reimagining and renewing India. The first lecture was delivered by Columbia University professor Arvind Panagriya, who served as vice chairman of India’s NITI Aayog, a government think tank, from 2015 to 2017. Other speakers included Richard Verma, a former US ambassador to India; Alyssa Ayres, author of “Our Time Has Come”; and Ajay Banga, CEO of MasterCard.